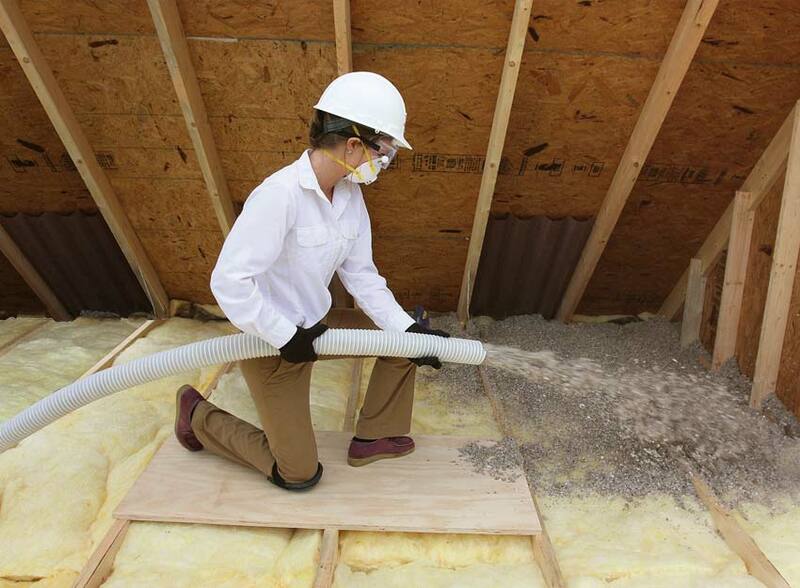 Cellulose Insulation Phoenix, AZ - Barrier Insulation Inc.
Blown-In cellulose insulation is one of the high quality insulation types we offer at Barrier Insulation. We proudly offer the highest performance cellulose insulation options available and install them in your attic, walls, or wherever you want rooms to stay more comfortable and energy efficient. Cellulose insulation R value is about 3.5 per inch, which is comparable to high performance fiberglass batt insulation. Installing an even layer that’s the correct depth is the key to this insulation system’s performance. Allow our team of cellulose insulation installers to come and get the job done right to insulate your attic, home, and walls the right way. Cellulose Insulation R Value is 3.5 per inch. This is comparable to fiberglass batt insulation that’s commonly installed in walls and attics. Many homeowners prefer cellulose as it is made from natural materials and does not contribute to indoor air quality issues. Cellulose insulation is also a green material as it is made from 80% post-consumer recycled newspaper. This material is treated with a non-toxic fire retardant spray that also guards against mold and insects. Cellulose insulation cost averages about $850 dollars for an attic that is roughly 1,000 square feet. This includes enough insulation to sufficiently cover the area and the cost of labor to install it. Costs vary due to challenges such as attic access, if walls are already close, and if insulation removal is needed before new insulation can be installed. For more information on what it will cost to install cellulose insulation in your attic, please contact us. The oldest form of home insulation is Cellulose. It can be made using cotton, sawdust, hemp, straw, and many other plant materials that has a low thermal-conduction activity. However, it is now produced using recycled newspapers which is treated later on with a chemical that helps to reduce the possibility of ignition. Becoming popular in the 70’s at the time of the oil crisis, it went through a period of competition with the Fiberglass insulation in regards to fire-standards being lobbied by the Fiberglass companies, as well as the mineral companies. Even though Cellulose is chemically treated to increase the properties that made it flammable, there is still a risk of ignition with the potential to burn. Cellulose is generally made from one of these: Boric acid, sodium borate, or ammonium sulfate would be used for this as they are considered to be safe if it comes into human contact. There are some advantages to using these materials, for instance: These materials will reduce airflow drastically, and it is far less expensive. On top of that, it is considered to be safe, meaning that there are no serious health risks to take. However, the newspapers that are used do put off gases from the ink but, the insulation is used in sealed up areas and it is unlikely that any health issues will come from this. Yet, whenever handling insulation regardless of whether it is Cellulose or Fiberglass, a person should wear a breathing mask to protect their lungs. Both, Fiberglass and Cellulose are used as for insulation, however, they both have their own advantages so be sure to search up what their advantages are before choosing. Of course, there are also other types of blown-in insulation not covered here. Other types of blown-in insulation include: rock wool, fiberglass, Insulsafe SP, and other loose fill blown-in insulations. Receive A Free Blown-In Cellulose Insulation Quote Today! Receive a free quote for cellulose insulation installation at your home by getting in touch with our team today! We can help you with a quote by getting an accurate estimate of how much space you need insulated and what areas of your home you are considering having cellulose insulation installed in. We welcome your questions over the phone or you can submit your information through our contact page.